With the Science of Pie coming up in just a few weeks, we’ve been spending a lot of time thinking about baked goods. And one ingredient in particular has really captured our imagination—the egg! In the realm of baked goods, eggs are highly revered for their binding and leavening abilities. The fats and proteins within an egg can also contribute to important properties like moisture, texture, and mouthfeel . But what if you don’t eat eggs? Whether allergic, vegan, or cutting back on cholesterol, many of us are looking for ways to cut back on or even completely eliminate eggs from baked goods. Last week’s DIY Kitchen Science explained how chemical leaveners like baking soda and vinegar can generate pockets of air in a baked good that can impart a fluffy texture without the eggs. This is great workaround for light and airy cakes; however, baked goods like chewy brownies, crispy cookies, and dense quick breads require less aeration but rely on eggs more for binding, moisture, and mouthfeel. We scoured the internet to see what kinds of products home cooks use to replace eggs in their baked goods and were blown away by all the options out there. Most of the substitutes we found act as binding agents and contribute to the moisture, mouthfeel, and final texture of the baked good. Because eggs are made up of fats and proteins, we expected egg substitutes to contain similar combinations of these two molecules; so imagine our surprise when we realized that almost all of the common egg substitutes we found are carbohydrates! Pumpkin or squash purée Fruits and vegetables, including those not listed here, are full of starches and other polysaccharides such as amylose, pectin, amylopectin, cellulose, and hemicellulose. Chia seeds Mixed with water, polysaccharides in the seed coat form a gummy gel. Flaxseed and chia seed polysaccharides are heterogeneous mixtures of various sugars including xylose and glucose [2,3]. Xanthan gum Xanthan gum is a modified form of the polysaccharide cellulose produced by Xanthamonas campestris bacteria . Carageenans Agar agar (agarose and agaropectin) and polysaccharides called carrageenans are derived from red algae and seaweeds. Ener-G Egg Replacer A vegan egg substitute, Ener-G Egg Replacer is a mixture of potato and tapioca starches, leaveners, and cellulose gum. More specifically, these common egg substitutes are carbohydrate molecules, called polysaccharides, that are made up of long chains of sugar molecules. At the molecular level, these polysaccharides are very different from the proteins and fats found in eggs. On a larger scale, however, polysaccharides can form extensive networks much like those formed by denatured egg proteins . For example, tapioca starch forms chewy boba when cooked, while a fruit polysaccharide called pectin forms the gelatinous base of jams and jellies. Formation of polysaccharide gels. 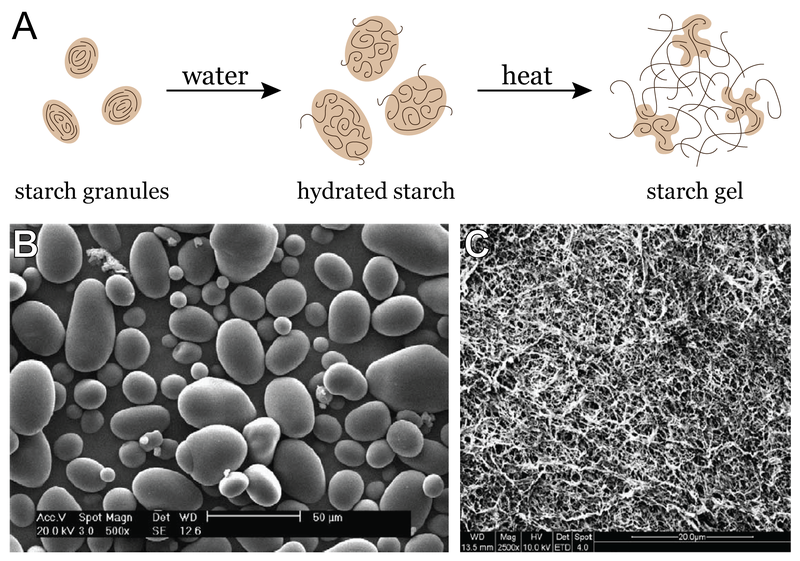 (A) Polysaccharides (lines) are packed into larger structures called starch granules; upon adding water, the starch granules swell and polysaccharides begin to diffuse out of the granules; heating these hydrated starch granules helps polysaccharide molecules diffuse out of the granules and form a tangled network. (B) Electron micrograph of intact potato starch granules . (C) Electron micrograph of a cooked flaxseed gum network . This formation of gummy networks gives polysaccharides the ability to replace eggs in many baked goods with relative success. The tangled networks can entrap water and other molecules in the batter, locking in moisture and keeping ingredients evenly dispersed. Polysaccharides also interrupt the springy gluten networks formed by flour to create a more tender, delicate texture often desired in muffins and quick breads. And just as a network of egg proteins can hold things together, polysaccharide gels help keep baked goods from falling apart. Who would have thought that such different molecules could function so similarly in the kitchen! Bergquist DH, Updated by Staff (2007) Eggs. In: John Wiley & Sons, Inc., editor. Kirk-Othmer Encyclopedia of Chemical Technology. Hoboken, NJ, USA: John Wiley & Sons, Inc. Available: http://doi.wiley.com/10.1002/0471238961.0507071902051807.a01.pub2. Accessed 23 April 2013. Chen H-H, Xu S-Y, Wang Z (2006) Gelation properties of flaxseed gum. J Food Eng 77: 295–303. doi:10.1016/j.jfoodeng.2005.06.033. Lin K-Y, Daniel JR, Whistler RL (1994) Structure of chia seed polysaccharide exudate. Carbohydr Polym 23: 13–18. doi:10.1016/0144-8617(94)90085-X. “Hydrocolloids Primer.” Cooking Issues. Accessed 23 April 2013. http://www.cookingissues.com/primers/hydrocolloids-primer/. Yang J-H, Yu J-G, Ma X-F (2006) Preparation and properties of ethylenebisformamide plasticized potato starch (EPTPS). Carbohydr Polym 63: 218–223. doi:10.1016/j.carbpol.2005.08.059. Tags: baking, biochemistry, carbohydrates, eggs, gels, polysaccharides, proteins, starch, vegan. Bookmark the permalink.